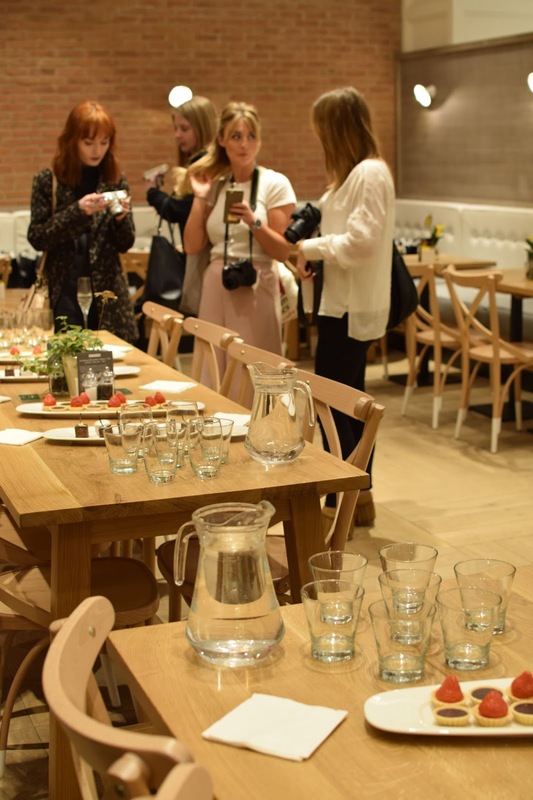 On Tuesday I was very kindly invited along to the Fenwick Beauty Week Beauty Blogger Event, I wasn't able to make it last year and I was so jealous at all the photos I saw, so luckily I was able to go this year! 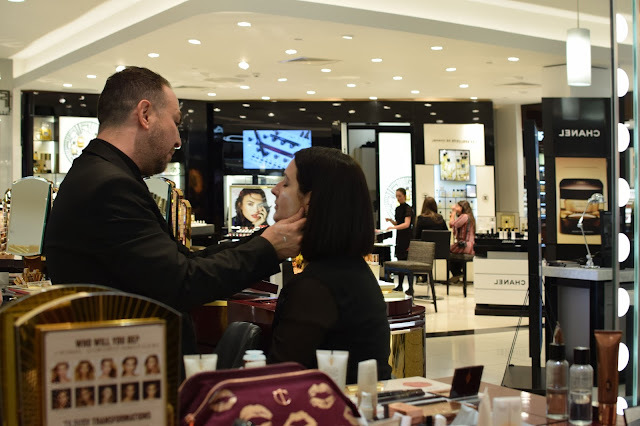 Fenwick Beauty Week runs from May 7th-15th where there will be masterclasses and activities taking place throughout the Beauty Hall as well as product launches and offers. 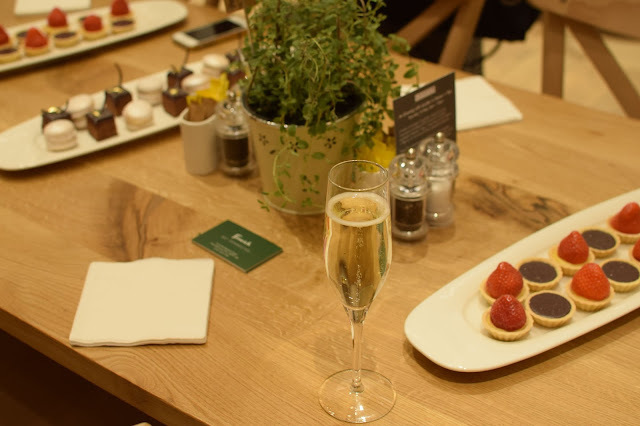 We arrived at Mason + Rye and were greeted with a glass of bubbly and some delicious sweet canapés. Beauty Buyer Grace Ruthven told us a little about the event and what was on offer, we were able to pick 2 complimentary beauty treatments on counter from different beauty houses. The slots were at 6pm & 7pm and we had to grab a card for what we wanted to do. 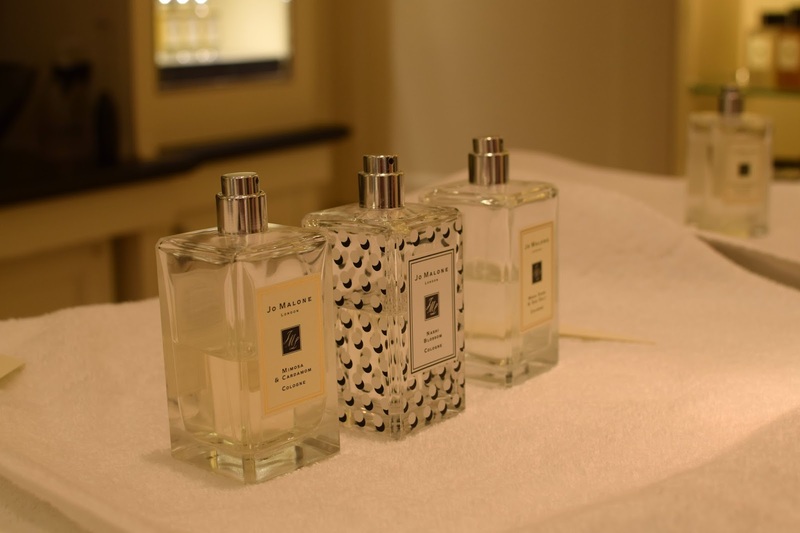 We were told beforehand the treatments on offer and I went for Jo Malone and Charlotte Tilbury! So at 6pm we split up and wandered off to our first treatment slot. 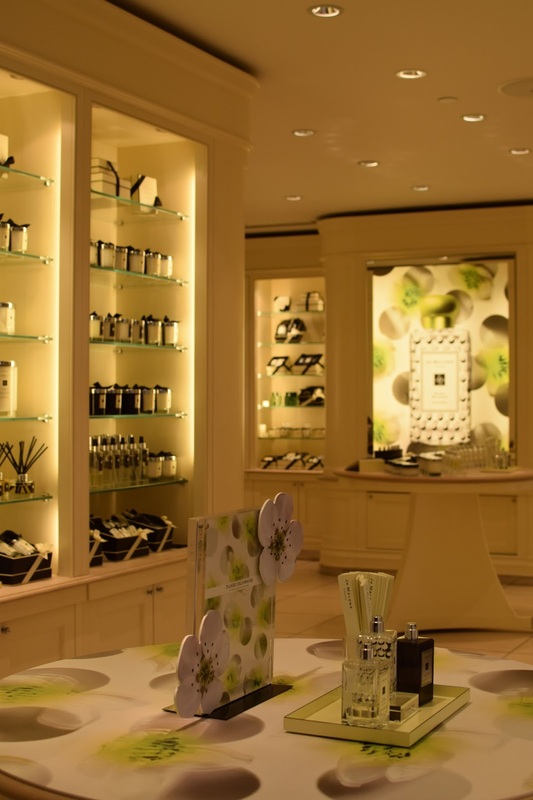 The arm and hand massage from Jo Malone sounded too good to miss, there were 3 slots for each time and I'm so glad I snagged one. 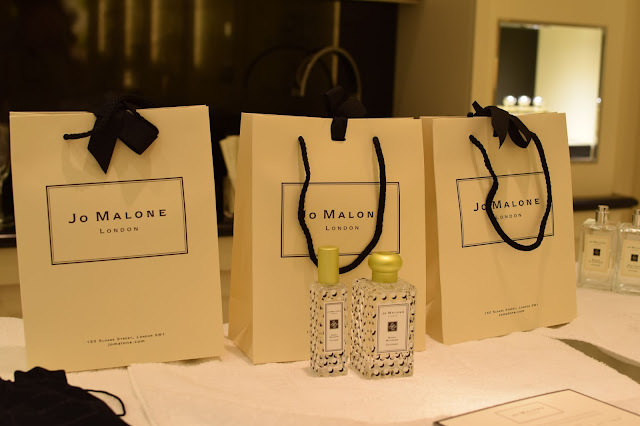 I've only had candles from Jo Malone but I'm obsessed with all their scents, more so now! The lovely Victoria told us about their new Nashi Blossom scent before asking us some questions and matching us up to a scent she thought we'd each like. I got the Mimosa & Cardamom, it smells incredible! 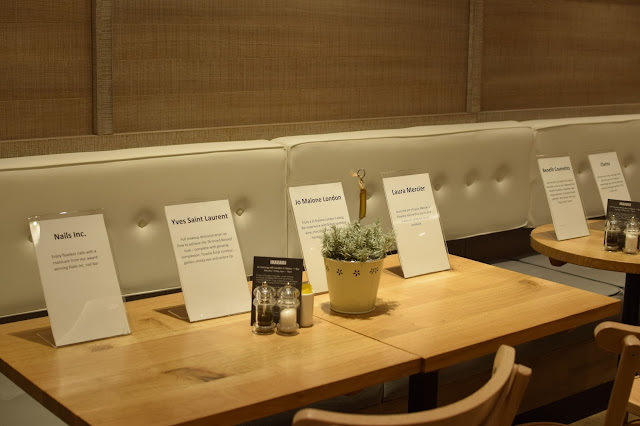 We were told about combining scents which I knew they did but I haven't experienced it before, she combined the Nashi Blossom scent with each of our individual scents and the smells were amazing! Onto the fab massage! 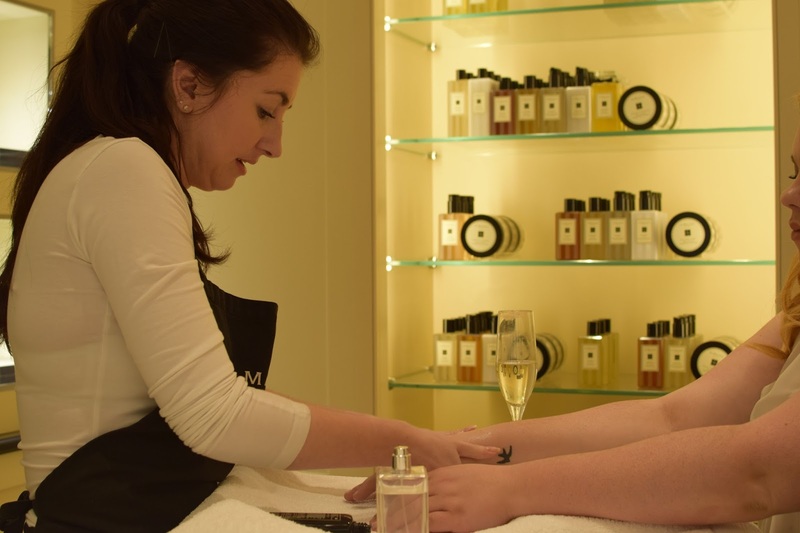 I've never had a hand & arm massage before but I really enjoyed it, she used the Body Creme's on us in each of our scents, massaged them in and told us about the benefits of the creme and how it's not just a scented lotion. After the cremes were massaged in she finished it off with the vapours over the top, I don't think I've ever smelled so good! Victoria was lovely and I now definitely need all of the products! 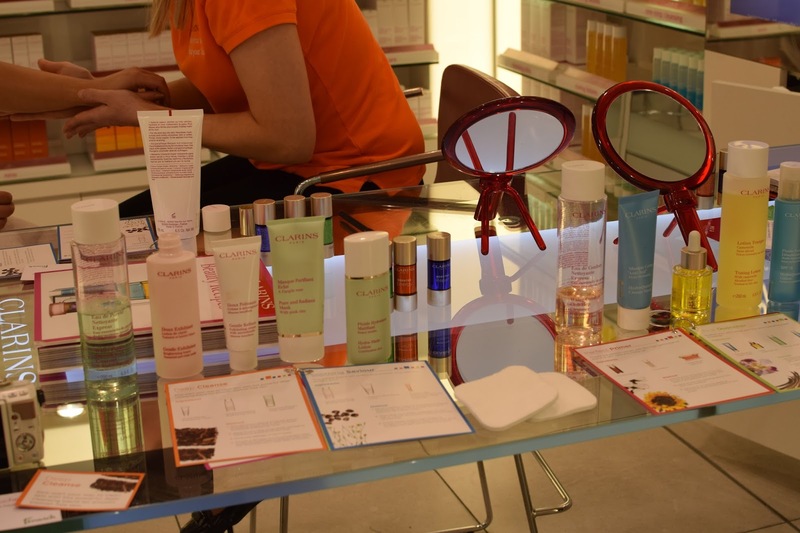 We even got a little goody bag before we were released back into the Beauty Hall! 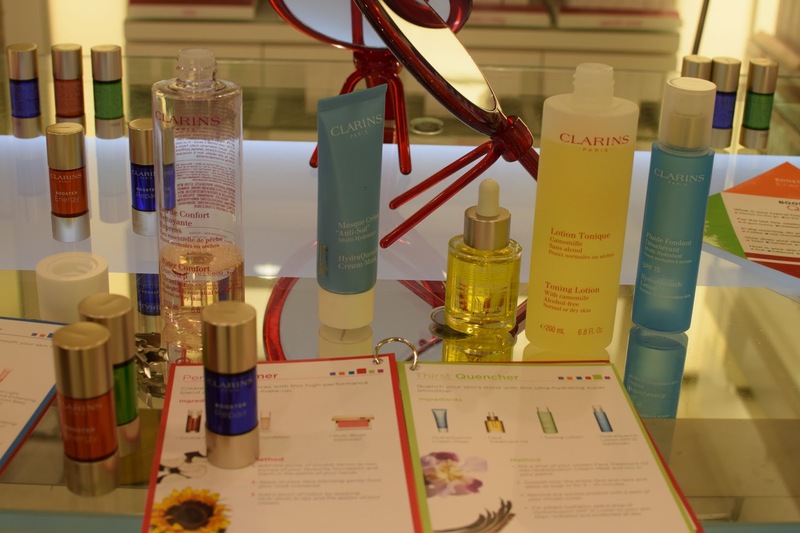 At 6:30pm after our massages me and Amy must've looked like lost puppies waiting for our next slot, so one of the lovely ladies was able to squeeze us in to the Clarins counter. We were able to choose a beauty boosting skin treatment. I went for the Thirst Quencher, as there wasn't much time and I didn't want to walk around town with no makeup on I chose to have the treatment on the back of my hand, those hands were pampered tonight! The treatments are made to find you inner mixologist, to find the perfect blend for you. 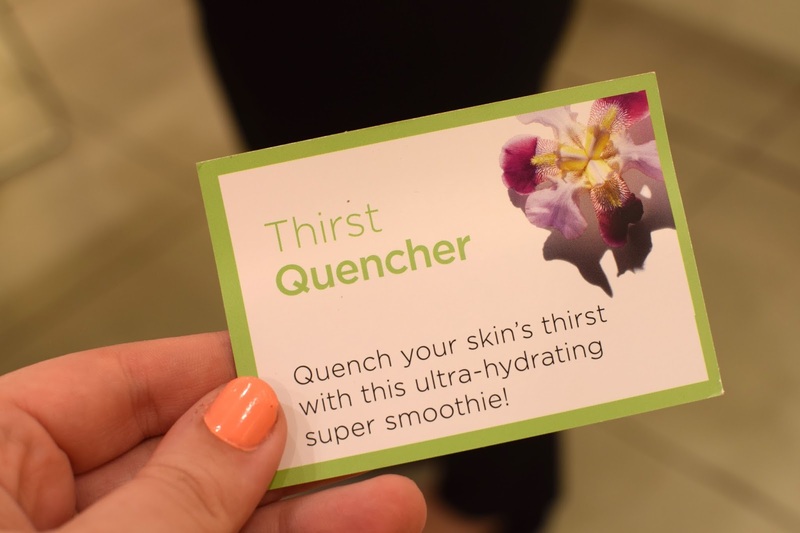 My skin is on the dry side so the Thirst Quencher was an ultra-hydrating super smoothie! The products the lovely lady used on me were the HydraQuench Cream-Mask which mad my skin so soft! The Blue Orchid Face Treatment Oil and Toning Lotion. She gave us a gorgeous pick n mix style bag full of minis of all of the products she used as well as the Instant Eye Makeup Remover, which I've heard is great, the Eye Contour Gel and the Gentle Exfoliator Brightening Toner. 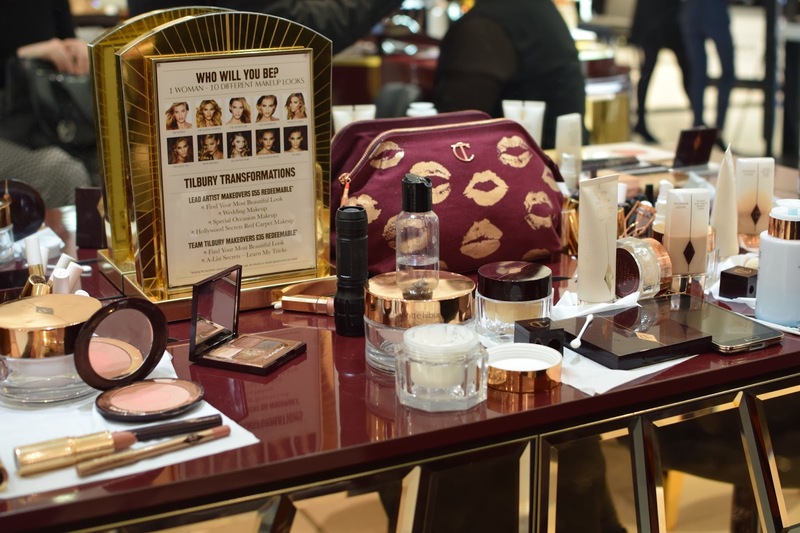 Finally at 7pm I made my way over to the Charlotte Tilbury counter for a masterclass on the Dolce Vita look, which is apparently Charlotte's favourite of all her makeup looks. The session was led by the wonderful Zak, who was full of knowledge and experience! He was so friendly and made us feel really welcome. 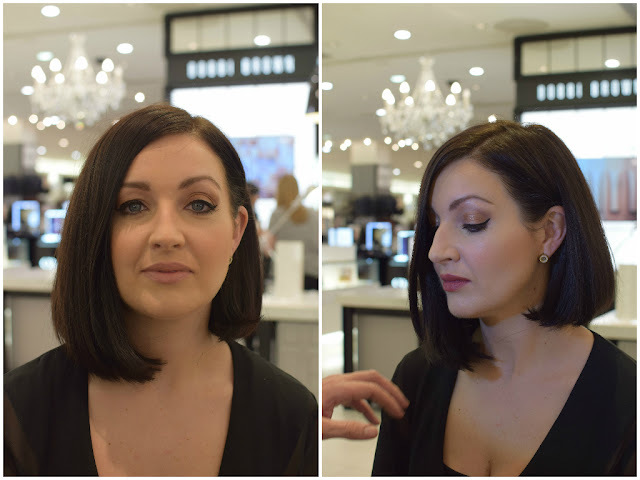 The lovely Clare acted as the model and she was just as knowledgeable! 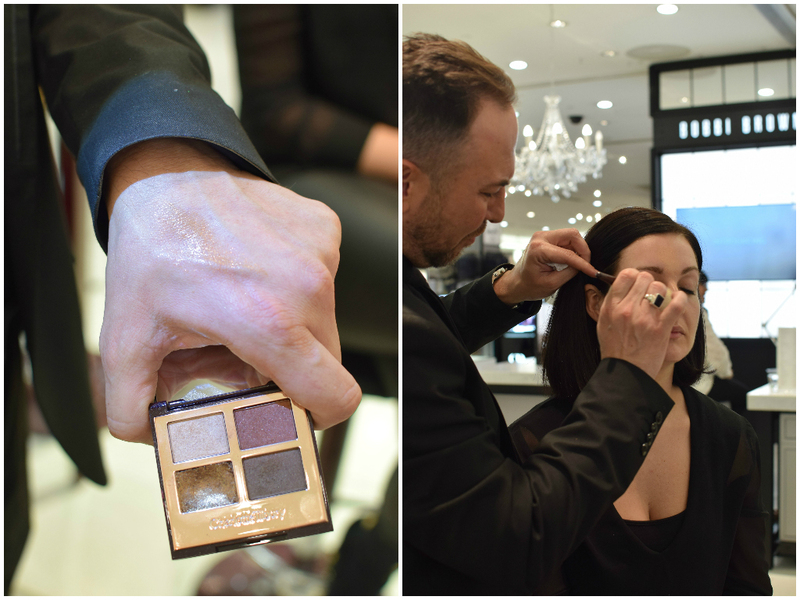 We were talked through all the products in the look in depth and shown how they apply, from base to eyes to lips and everything in between. I've got a few bits from Charlotte Tilbury but now I just want everything! 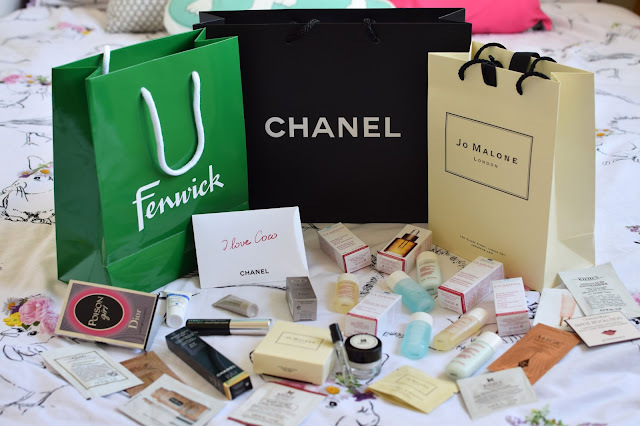 After the fabulous session at Charlotte Tilbury we headed back to pick up our goodie bags which are full of amazing bits from everywhere I visited along with Chanel, Dior, Laura Mercier, REN, Clinique, Kiehl's and more! 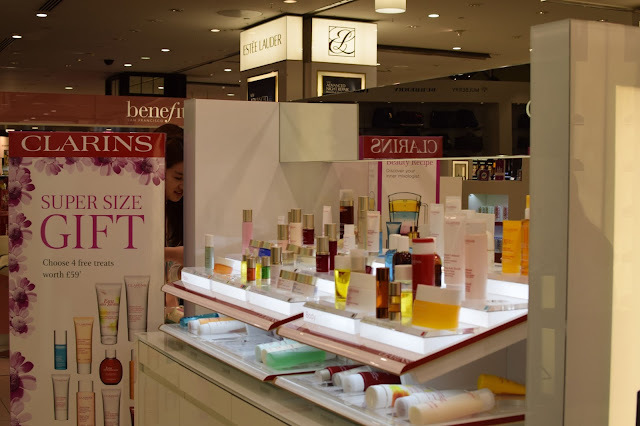 I was always apprehensive about beauty counters, I've often felt looked down upon, I once bought a mascara at Benefit and neither lady even looked up from their conversation, just scanned my product and took the money, not even a hello or thank you! Never in Fenwick's mind! 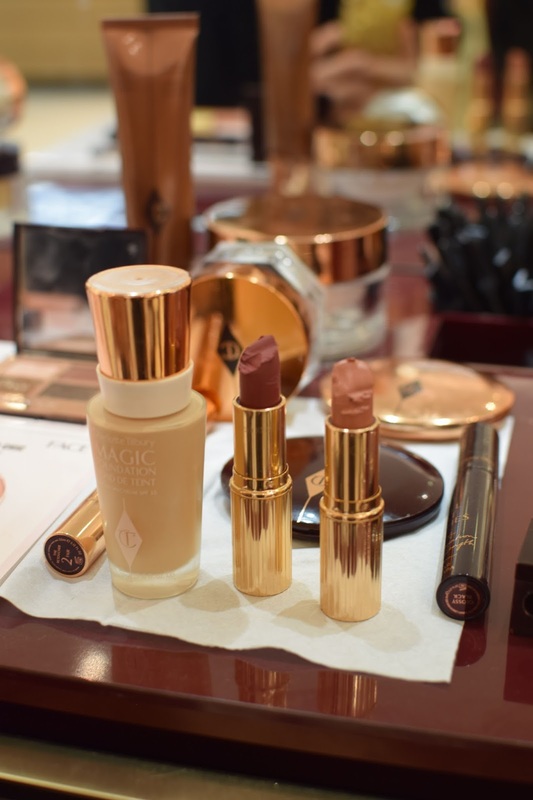 So now I feel more comfortable browsing the Beauty Hall without feeling like I look like rubbish! I had a lovely night and now I know the counters better and how lovely the staff are, I will definitely be back to browse without feeling intimidated! I was simply amazed at the architecture of this absolutely beautiful venue!! The environment was unbelievable. I was fortunate enough to visit venues in houston like this, we found awesome things one after another after another.